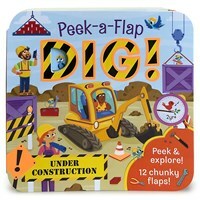 Peek and explore diggers, loaders, cranes, big trucks, and more, with educational facts and peek-a-boo surprises! Jaye Garnett is a pen name for the creative team at Cottage Door Press. We use a name like this when we work together on a story. We choose a name that stands for "red bird," which is our cheerful little mascot.